Testimonial 4 - Sparkle Pools Inc.
Sparkled all the way from Start to Finish! After meeting with Katie our family decided to purchase a Sparkle Pool. Shortly thereafter, I learned my husband Brian would be out of town and I, along with our 3 yr. old son, would stay behind as the ground work began. I can say with delight the Sparkle Pool Family were friendly, informative of all the steps along the way, and most importantly very professional. In no time, our pool was completed and before long we were experiencing all of the enjoyment a pool can bring with family and friends. 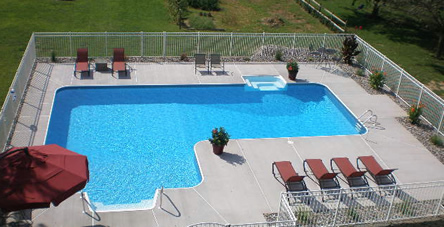 We are thrilled to have a pool and are thankful for our positive experience with Sparkle Pool. We would definitely recommend Sparkle Pool to family and friends. Our neighbourhood of eight homes has four Sparkle Pools! A very special thank you to Ray and your wonderful Sparkle Pool Family for the exceptional service provided and your ongoing support. We love our Sparkle Pool!